In the recent past battery and fuel cell technology are undergoing rapid advancements. The supercapacitor technology has to overcome these devices in economy, performance and utility to make itself a viable option. Thus the challenges faced by this technology are unique. Since the nineteenth century, chemists have studied the storage of electrical charge in the interface between an electrode and an electrolytic solution. But until General Electric patented electrolytic capacitor using porous carbon electrodes in 1957, it was not adopted for practical use. However, the supercapacitor market started picking up only in the late nighties when the unique characteristics of these devices, like high power density and long cycle life coupled with reliable and safe operation at a wide range of temperatures started finding takers. As of 2016, there are around forty supercapacitor manufacturers globally. Similar to the conventional capacitor, the supercapacitor stores energy by charge separation. They are divided into various classes depending on the mechanism of charge storage. These are Electrical Double Layer Capacitor (EDLC), pseudocapacitor and hybrid capacitor. Of these the EDLC is the most common. Its construction is similar to a battery in that there are two electrodes immersed in an electrolyte, with an ion-permeable separator located between the electrodes to prevent electrical contact. In the charged state, the electrolyte anions and cations move toward the positive and negative electrodes, respectively, giving rise to two double layers, one at each electrode–electrolyte interface. Pseudocapacitors rely on highly reversible redox reactions on the electrode surfaces making them amenable to high energy densities. The trade-off is a lower cycle life. The hybrid capacitor combines the advantage of both these principles by having one electrode storing energy as a pseudocapacitor while the other stores energy similar to the electrical double layer capacitor. The growth of the supercapacitor technology is slow as it faces challenges at various fronts. In the recent past battery and fuel cell technology are undergoing rapid advancements. The supercapacitor technology has to overcome these devices in economy, performance and utility to make itself a viable option. Thus, the challenges faced by this technology are unique and some of the issues that have been encountered are detailed in this article. It is imperative for someone in this field to understand the various issues that he might encounter. This article tries to shine a light on these. Even though the energy density of supercapacitors (less than 10 Wh/kg) is much higher than conventional dielectric capacitors, it is considerably lower than batteries and fuel cells. A lot of research is being done to increase the energy density of supercapacitors without surrendering its high power capability. This is being done by developing advanced materials and configurations for improving the energy density. Exploring cheaper preparation and processing of these materials and lowering of fabrication costs are also being looked into so as to reduce the cost and make the supercapacitor economically feasible for design engineers to incorporate it into their designs. The research into supercapacitors can be categorised depending on electrode materials, configurations and electrolytes used for supercapacitors. The research trends and challenges in each of these are characterized below. Due to its properties like good chemical stability, good electrical conductivity, availability, and moderate cost, carbon is one of the most favoured materials as far as supercapacitor electrodes are concerned. Activated carbons are the most preferred carbon by manufacturers as they are cheaper and have large surface. But since their pore system is highly randomized, ionic transport is poor which causes low conductivity. Considerable research is being done to control the pore sizes by controlling the activation process. The latest in this is the introduction of templated carbons. The carbon is produced by filling the pores of an inorganic sacrificial template (zeolites, silica or scaffolds) with a carbon precursor, followed by carbonization and subsequent removal of the template. 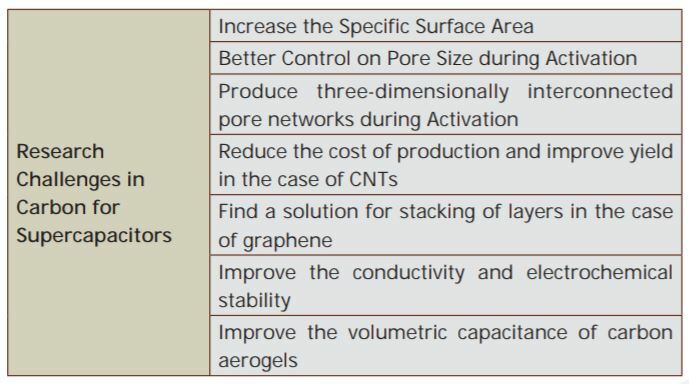 This results in a well-defined pore diameter, high surface areas and three-dimensionally inter-connected pore networks thereby, giving rise to very high specific capacitance. But as of now, the high cost of production and low yield of carbon has yet to make this technology viable. Graphene synthesized by chemical reduction of graphene oxide has recently demonstrated capacitances of 205 F/g. The performance of graphene is independent of the nature of porosity due to its 2D structure. But a major issue is the stacking of the various graphene layers. As of now, research needs to focus on new preparation, modification and assembling routes to avoid this graphene stacking while making the supercapacitor electrode. Another type of carbon that excited the research community was carbon nanotubes or CNTs which are the potential candidates for future supercapacitors. But their popularity seems to have decreased in the last couple of years due to stacking problems and higher cost of production. But they are used as additives to improve the conductance and electrochemical stability. Again there is considerable scope of research to reduce the cost and improve the porosity. Another very important carbon is the carbon aerogel which is prepared by the poly-condensation reaction of resorcinol and formaldehyde. The pyrolysis in an inert atmosphere leads to the formation of a porous carbon aerogel with a controlled and uniform pore size between 2 and 50 nm, and high electrical conductivity. The capacitance values are in the range of 50–100 F/ g, for organic and aqueous electrolytes, respectively. But due to the very low density of these materials, it has poor volumetric capacitance. The use of materials that display pseudocapacitive characteristics is one of the most promising methods to improve the capacitance. In this phenomenon apart from electrostatic forces, quick faradaic reactions also take place. Transition metal oxides are the most common additive that displays pseudocapacitive properties. Ruthenium oxide has been found to display a capacitance of 900F/g. Since the cost is prohibitive, efforts are on to form composites with other oxides, conducting polymers or carbon based materials so that its content can be reduced without compromising the performance. A much cheaper and abundant option is manganese dioxide which exhibits capacitance in the range of 100-260F/gm. The main hindrance to manganese dioxide is its low conductivity. In spite of the awareness of pseudocapacitive behaviour for quite some time, the mechanisms of pseudocapacitance and electrochemical stability in non-aqueous electrolytes require further investigations. 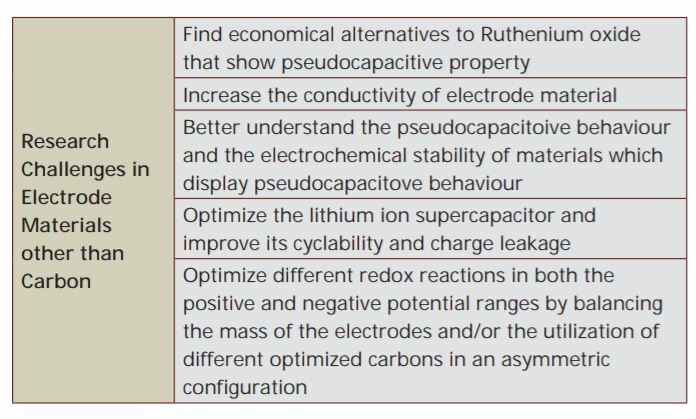 Finally, an immediate challenge is to optimize different redox reactions in both the positive and negative potential ranges for the usage of maximum potential pseudocapacitance by balancing the mass of the electrodes and/or the utilization of different optimized carbons in an asymmetric configuration. Another innovation that has garnered a lot interest is the lithium-ion supercapacitor because of the higher voltage per cell that it provides. The substrate is doped with various amounts of lithium and stores energy using both the conventional electrostatic method and the faradaic Lithium ion battery technology. But issues like poor cyclability and charge leakage need to be addressed. Due to the squared dependence of energy density on the voltage window of the cell, a slight increase in the voltage window can increase the energy density drastically. Even though aqueous electrolytes are the most common they are inherently limited on account of gas evolution due to decomposition at high voltages. A comparison of the three types of electrolyte is given in the Table 1. In spite of the high energy density possible with ionic liquids, the biggest drawback in its use is that most ionic liquids are stable only at high temperatures and room temperature ionic liquids are very costly. There is a lot of interest to come up with room temperature ionic liquids which are economically viable for this purpose. Another important factor that needs optimization is the proper pairing of electrolyte ions to the pore size of the electrode material. It has been found that capacitance increases when the electrolyte ion size is comparable to the pore size. The large pores need to be accessed quickly while the accessibility of smaller pores is more kinetically limited. Therefore, research needs to concentrate on this aspect of proper pairing of electrolyte and electrode. The biggest detriment to the wide scale acceptance of supercapacitor as an energy storage device is its cost. 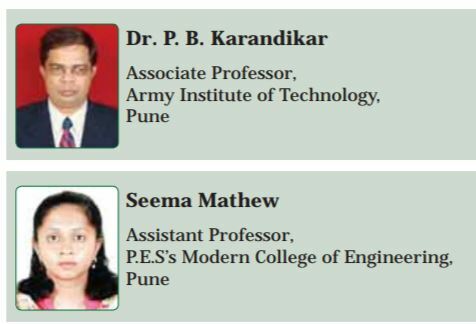 Electrode materials need to be produced using simpler procedures without the need of expensive catalysts, templates or excessive temperatures. Simplification of existing methods too need to be looked into. Another major challenge is the current collector and the method of adhesion of the electrode material to it. As of now, the slurry method has been used the most but this requires binders which tend to increase the internal resistance of the supercapacitor. Thus, there is an urgent requirement for low cost conductive binders suitable for this technology. Also, new methods of adhering the electrode material onto the current collector need to be found keeping the internal resistance of the supercapacitor as low as possible. The most sort after characteristics of the supercapacitor is that energy stored in it can be released within a very short timeframe (in the order of seconds), and can, be recharged in the same time. On the other hand, even the high power Lithium ion batteries, take several minutes or more to release all their energy, and several minutes to hours to be recharged. Moreover, due to its unique energy storage mechanism the supercapacitor can be discharged completely without any issues to its life. In the case of batteries, the deep discharge can be detrimental due to the chemical changes that tend to take place. The other very important advantage the supercapacitor has is the issue of thermal runaway in batteries which can have catastrophic effects including catching fire. Supercapacitors tend to age gracefully and are not prone to thermal runaways. But the technology has not yet found widespread acceptance among design engineers. 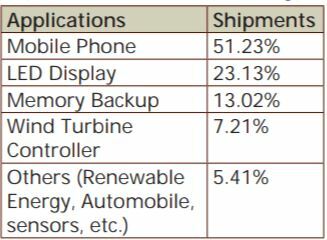 The largest consumer of the supercapacitors is still the mobile phone industry as shown in the Table 2. As of now the supercapacitors are typically used in tandem with batteries in most energy storage applications. Applications that rely completely on supercapacitors for energy storage are still very low. One of the major reasons for this is the requirement of a reliable and efficient power electronics interface. Charging and discharging of the supercapacitor have very different challenges. It is normally expected that the supercapacitor charge quickly but discharge slowly. This means the time period of the charging circuit should be kept as low as possible which might require an additional charging circuit. Moreover, supercapacitors are required to deliver large currents at varying voltage. In the case of batteries, the range of voltage between discharged and fully charged is not very wide while for a supercapacitor the fully discharged voltage is zero. This means that supplying power at a constant voltage, which is normally the requirement for most applications, require DC/DC converters. Another challenge to the design engineer is the non-uniformity of cell voltage in a stack of supercapacitors connected in series. Those cells that are under higher voltage stress tend to have lower life compared to those under less stress. To combat these issues a stack of supercapacitors requires active or passive cell balancing. All these power components along with the supercapacitor, tend to make the supercapacitor based energy storage system costly and thus this technology is still not able to compete with other available storage approaches like batteries and fuel cells. A very recent requirement is for flexible energy storage for wearable electronics. Though researchers are producing flexible supercapacitors it has not reached mass production stage. More niche applications for this technology need to be identified. A method of identifying applications that can be catered by the type of supercapacitor (this includes the type of material used, configuration, etc.) will also make it easier for a design engineer to utilize the supercapacitor in a particular system. More awareness among the end users about this technology will also create a larger market. The global supercapacitor market as on October, 2016 is approximately $400 million according to Paumanok Publications, Inc. who has monitored the global supercapacitor markets since 1993. It has bitten into the $95 billion global battery market and the $17 billion global capacitor market. The Indian supercapacitor market witnessed an increase in demand in the standalone and batteries combination devices. According to the market research firm 6Wresearch India, 1 Farad supercapacitors experienced more than 76% market share in the fourth quarter of 2013. Some of the challenges of the supercapacitor market are unique. Even now there is a lot of reluctance in industry to embrace this technology. Even though the automobile industry is the largest perceived market and a few automobile manufacturers are claiming to use the supercapacitor in some of their models, we haven’t yet seen them accept this technology in their entire range. Moreover, as most of the supercapacitor manufacturers in possession of path breaking technology are small players in the energy storage market, they are not able to use existing channels of distribution and contact with customers. This keeps them from completely exploiting the energy needs of the consumer. In many countries, apart from manufacturing of this device, developing market for this is also a challenge. According to Dennis M Zogbi a market analyst in this niche area, “Even though early on the supercapacitor manufacturers were signing joint ventures and research and development deals with many end-users in multiple industries, only a few end-markets actually were cultivated into multi-million dollar channels of revenue.” Thus, there is an urgent need to better access the vertical market. Another major concern in the growth of this market is the level of differentiation of technologies within such a small market. The supercapacitor market itself is divided into (i) activated carbon based or EDLCs, (ii) Hybrid capacitor (iii) Lithium ion batteries. This means that the same manufacturer finds it difficult to manufacture all the three types and thereby, increase his market share and thereby, increase the supercapacitor market share. 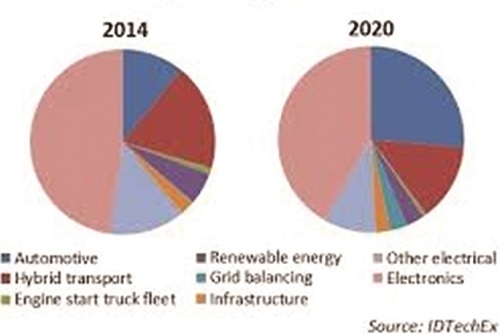 The figure 1 shows the supercapacitor market shares by application in 2014 and the expected share in 2020. As the world starts moving towards electric transportation the automotive market looks to make larger strides. 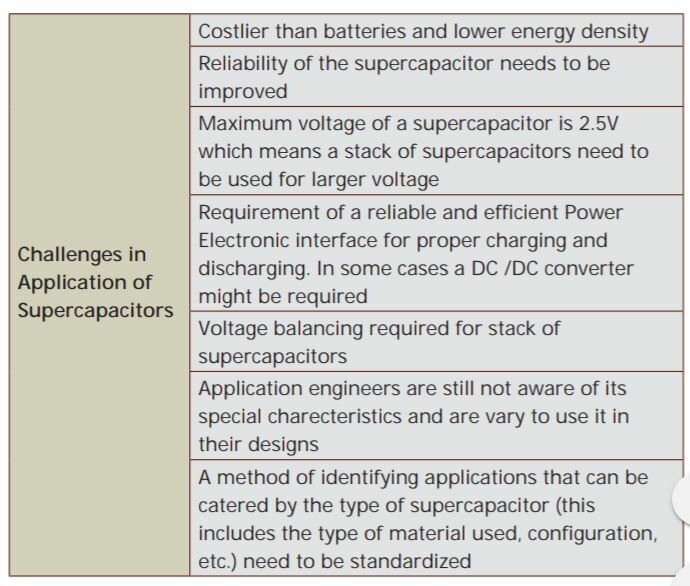 Thus to summarize, the challenges before the supercapacitor technology are many. These challenges need to be countered at different levels right from research, manufacturing and improving the market conditions. It is hoped that as the world moves towards greener technologies as epitomised by the Paris Agreement, this technology will grow by leaps and bounds. If you want to share thoughts or feedback then please leave a comment below.